This topic has come up in a couple of different contexts recently, so I thought it was time for a post. I am relatively new to owning and using a heat mat for seed germination, so I welcome comments from more experienced users. Seeds require different soil temperatures for germination. You can refer to various charts for ideal germination temperature, such as this PDF from Oregon State Extension, or books on vegetable growing or propagation (Suzanne Ashworth’s Seed to Seed is very useful). Depending on the temperature of your seed-starting environment, you may have to raise soil temperatures by artificial means. My seeds are starting in our upstairs furnace/laundry room, which stays pretty warm (unless, as in spring 2012, outdoor temperatures are unseasonably high and the furnace hardly ever goes on), but I still found that a few crops were sluggish, so I decided to invest in a heat mat. You can buy these through just about any seed catalog or gardening supply site. 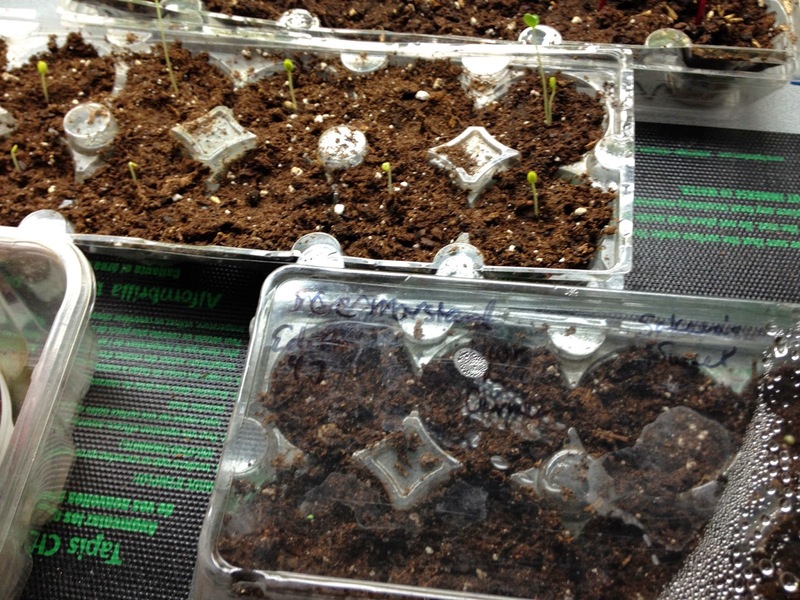 Note that the mouse melons in the upper set have sprouted. This means that I need to move them off the mat to another location. (Problem is I don’t have space anywhere else, but this is a separate issue; see “eyes bigger than garden” concept in last post.) Seeds of heat-loving plants in families like cucurbits and nightshades need warm soil temperatures to germinate, pretty close to the 87 degrees F. a thermometer just registered in the mouse melon cells, but seedlings will be damaged by prolonged exposure to those temperatures. They are going to prefer something closer to 70 F, which should be provided by the room temperature space under lights. So if you want to give your melon, tomato, eggplant, or other heat-loving seeds a boost, especially if your seed-starting room is cold (a lot of people use basements), do try a heat mat, but do your seedlings a favor and move them off it after germination. Some seeds prefer colder temperatures (I’ve tried a few where the recommended soil temp was 50-60, and I had to put them in the chilly upstairs bathroom to get them going), but most are going to be slow to start in cold rooms. I suppose if you want to maintain 70 soil temp in a 60-degree room, you could use a heat mat but put something between the seedling flat and the mat – anyone try this? There are also temperature regulators available for some brands of heat mats. By the way, there is a pervasive bit of advice that goes “start your seeds on top of your refrigerator for bottom heat.” This works fine as long as you have an older refrigerator, but most of the new energy-efficient ones stay pretty cool on top, and vent what heat they produce somewhere else. But you may well have warm spots elsewhere among your appliances. I tend to put rising bread dough on top of the water heater (not enough space for much in the way of seed flats, though). I am likely going to invest in another heat mat next year, because it really does help to get seeds going fast, and convinces some to germinate that would otherwise fail. My electric rangetop has a keep-warm element with temperature settings that go as low as about 100 degrees. I put a metal baking sheet on the element to distribute the heat and put my planted seed pots on top. Works well! Good! And also some stoves have a warming drawer that can be set very low. Deciding to start some alpine strawberries from seed and missing my planned start of early-January (this was several years ago), I happened to fail to read the packets which said it could take THIRTY DAYS for the seeds to germinate! Panicking, I used our trusty seed-heating mats and the seedlings popped up in 7 days! I love the mats. Great! And yes, not perfect for every situation, but for so many seeds it helps them come up so much faster.